What can you say about a demigod like Tigerblade? And here's what Mark has to say about Tigerblade. Fighter-Cleric of Sif and Founder/Headmaster of Sif's School For Excellence near Mansfield. Formerly, Tigerblade worked in his family's jewelry business. The thing that impresses anyone when first seeing Tigerblade is that he is large, both lengthwise and widthwise. TB stands 7 feet 2 inches tall and weighs 345 pounds without clothes. [meta: these were both independently and randomly rolled at character creation time!] For all his bulk, however, he carries himself gracefully, and when called for, has a cat-like quickness that surprises many. He has black hair that is now graying around the temples. With his gauntlets off it can be seen that the pinkie fingers of his otherwise normal (but big of course) hands are animal-like (tiger perhaps?) and have Sharp claws. Tigerblade dresses well as befits someone who tries to impress the flock with Sif's message of Excellence and, of course, wears the holy symbol of a Cleric of Sif at all times. On his belt he wears a small woven gold pouch, which can radiate up to lamplight. When suited for battle he wears gold-edged blood-red dragon scale mail armor and wields a long sword. In his other hand he holds an ornate large steel shield. Even as a child, Tigerblade was fairly well known in Mansfield. He gained a reputation as a gentle giant that is slow to anger, but quite determined when moved to action. His great wisdom and superior skills drew the attention of some of the keener observers in town; among them Father John and Vandis' father Alkis. Sif's School For Excellence draws the most talented of youths from Mansfield and beyond. As the Founder and Headmaster of the school, Tigerblade has an excellent reputation among many of the leading families and master guilds in Mansfield. The sight of the large Tigerblade in the splendid blood-red dragon scale mail is impressive, and a great recruiting aid for the Temple of Sif. The sight of Tigerblade has a "negative" side, it makes him the most visible in an adventuring party. Thus he is usually, and often rightly so, seen as the biggest (so to speak) threat. Of course, Tigerblade does not regard this as a bad thing. While not strictly enemies, Tigerblade is not fond of thieves, and they are very wary of him. However, he has no problem with the use of thieving skills for good ends. 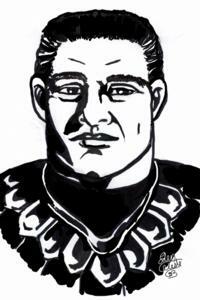 Tigerblade, the son of a jeweler, sees robbery as an evil act akin to slavery. When a thief steals a piece of jewelry that took a month to craft, the thief has stolen not only the item, but also the month of the craftsman's life - a form of slavery. Since Tigerblade has a CG outlook, he is likely to take matters into his own hands immediately if he witnesses a wrong. Hence, early on in his adventuring career he attacked Alphonso when he was caught stealing from his own party. Tigerblade now wears Ormond's Pouch, an intelligent pouch, which seems to feel even more strongly than Tigerblade on the matter. The pouch has killed or seriously injured a number of thieves that tried to pickpocket its contents. In addition, the pouch has the ability to attack at a distance, and has done so to thieves trying to pickpocket a crowd near a seemingly unaware Tigerblade (even when his back is turned). Thieves attribute all this to Tigerblade, and give him a wide berth. Tigerblade also has a reputation among a few of his fellow party members of having a sort of split-personality. There have been a number of occasions where he has attacked his fellow party members due to being magically charmed or having accidentally drunk a philter of madness. These, combined with the earlier Alphonso incident, led Malarky to coin the names "Mr. Tiger" and "Mr. Blade" for Tigerblade's good and evil sides respectively. Tigerblade's friends and closest companions, such as Vandis, fellow Cleric of Sif Marga, and the fighter instructors at his school Ivan and Hermon (the latter Tigerblade's cohort) know the truth. But he makes little effort to correct others in their suspicions. About an hour's ride from Mansfield along a good road is Sif's "School For Excellence". It is located in a region of farm lands and light forests on rolling hills. The school itself is located upon a high hill with a good view of the city in the distance. Even from afar the school is an imposing sight with a grand stone building and a smaller stone chapel near it. While it is clearly a work of fine architecture, it is only when someone gets close, do they see the extent of the artistry that went into it. Everything is designed, constructed, and embellished with great skill. Even such normally overlooked things like the stone fence and the wooden stables are works of art. The main school building, which is a grand stone building with a small barbican built into its facade. It houses class rooms, private quarters for Tigerblade, faculty, and dorms for students that don't live in Mansfield, a great dining hall, and various utility and store rooms. The Sif Chapel, which is a large stone building. The stables, which is a great wooden building. A few other minor buildings. A stone fence enclosing the main buildings. Below the hill there is a large field for riding horses, jousting, and other large scale activities. Beyond the field is a light forest used for camping, hunting, and other woodland activities. The school attracts the most gifted students (many on scholarships) and teachers from not only Mansfield, but also all over Anglia. In addition to regular classes there are learning and spiritual retreats for all ages sponsored by the Temple of Sif in Mansfield. The focus of the school is on the non-scholarly arts, from fighting and horsemanship to the highest mastery of the crafts. Students and teachers at the school need not be followers of the goddess Sif (although many are), but must be non-evil and devoted to excelling in their chosen field(s).